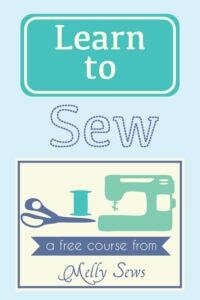 Hey y’all – today I’ve got a sewing for beginners post. 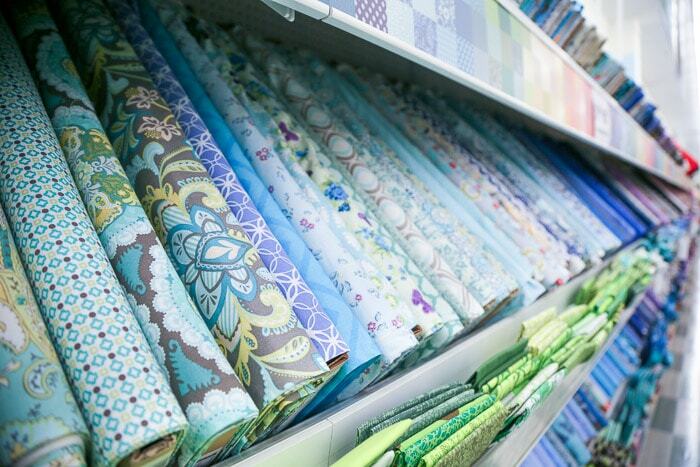 Buying fabric can be intimidating, especially if you’ve never done it before. 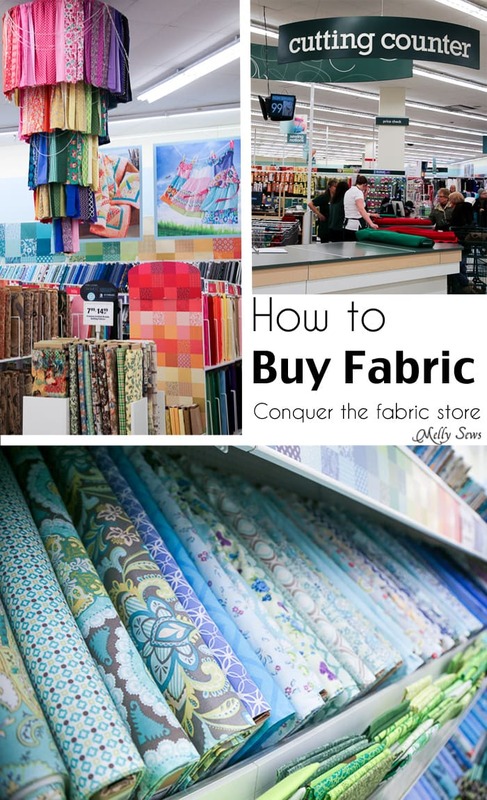 So here’s the lowdown on how to shop for fabric and conquer the fabric store. 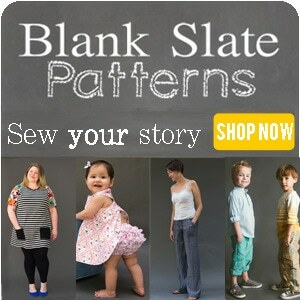 Special thanks to Joann Fabrics for these images. 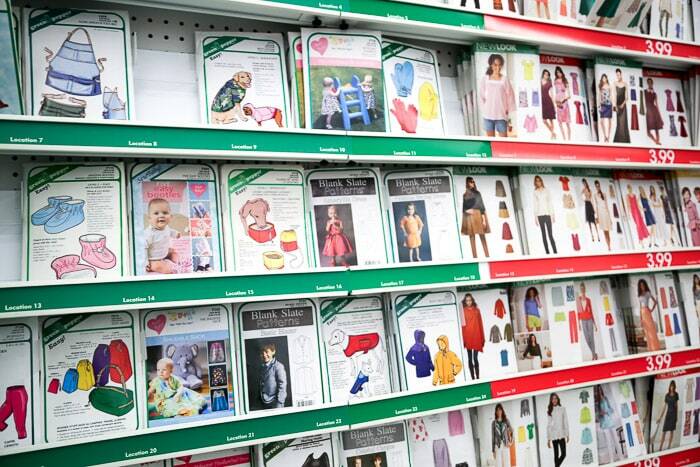 Though these images are from inside a Joann store, most fabric stores are going to be similar. And besides providing the images I asked for, Joann stores had nothing to do with this post – I haven’t received payment from them or anything, and all opinions are my own. I just happen to really like my local Joann, and I shop there as often as I shop with local and online indie stores – I find they each are great for different things. Or it can be displayed upright, like below. Apparel fabrics are often displayed with the fabric pulled over the end of the bolt – this is so you can see the drape of the fabric, as drape is more important for apparel. No matter how it’s displayed, the bolt end of the fabric will tell you what the fabric content is, how wide the fabric is, and will usually have a care code or care instructions for cleaning. 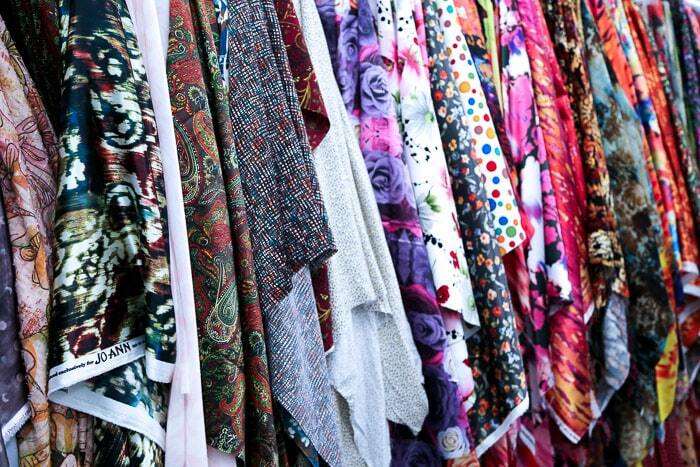 The price per yard will usually be there too, though keep an eye out for sale prices. Beyond the fabrics there are displays for sewing tools, sewing notions, closures, etc. 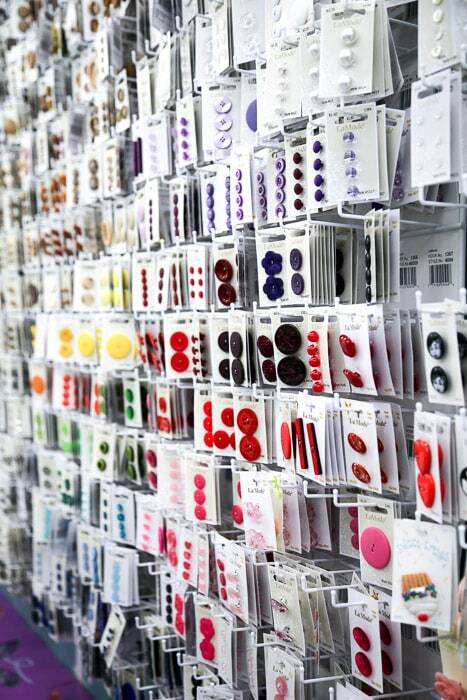 Below is the button aisle. If you’re confused about notions, this post for beginners is helpful. It will help you zero in on the things you really need among alllllllll the options. 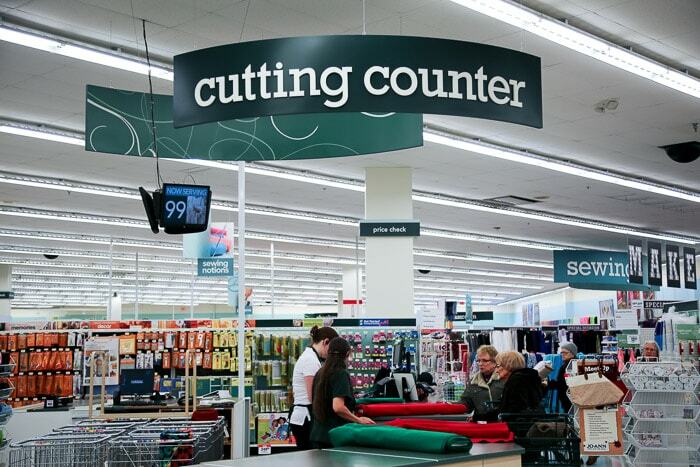 You’ll need to visit the cutting counter to get your fabric cut. All the Joann stores I’ve ever been in have had a ticket dispenser, where you grab a number for your turn to get your fabric cut. IN the picture below you can see the display showing that number 99 is now being served. Tip: if you are at Joann at a busy time, go get your number before you do your fabric shopping, unless you anticipate browsing for a reeeaaaallllly long time. 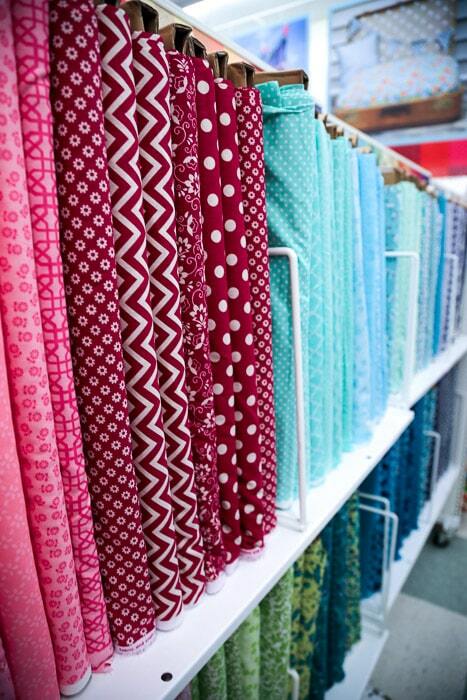 Once at the cutting counter, you’ll tell the cutter how much fabric you want. You can get pretty much any fractional increment you want. 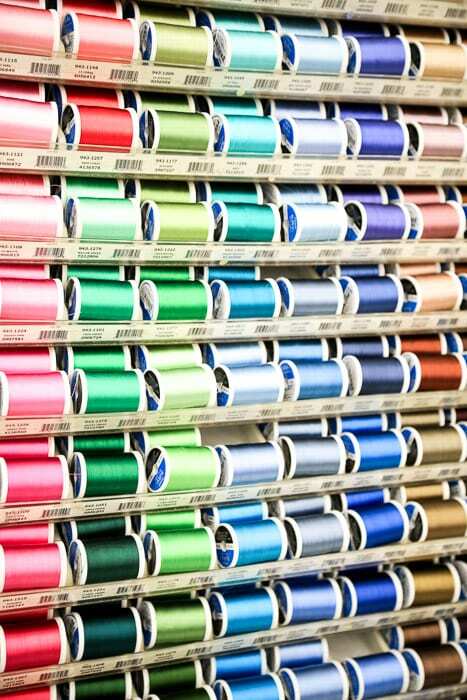 If you’re sewing from a pattern, consult the yardage chart to determine how much fabric you need. Patterns are kept in two places – first, there are some on walls and racks (like my Blank Slate Patterns that Joann stores carry). Other patterns are hidden in big filing pattern drawers. To find those, you browse through the paper catalogs on the tables, and find the pattern brand and number. The pattern drawers are labeled with a brand and range of numbers on the front, and you’ll open the correct drawer then find the patterns in numerical order. 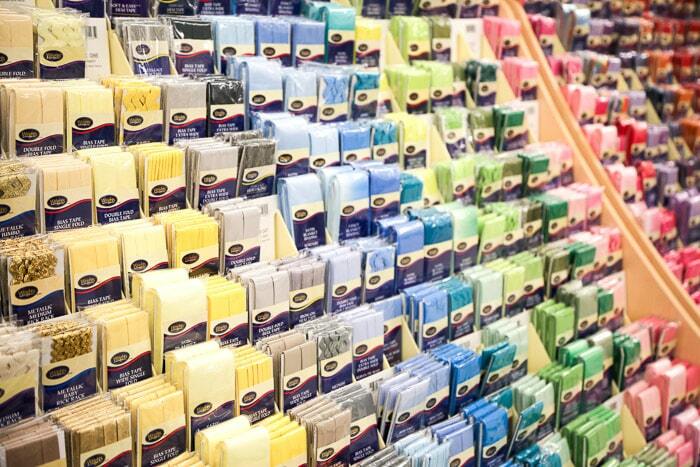 One last thing – if you’re totally lost, I have found that the majority of employees at fabric stores are more than happy to help as much as they can. 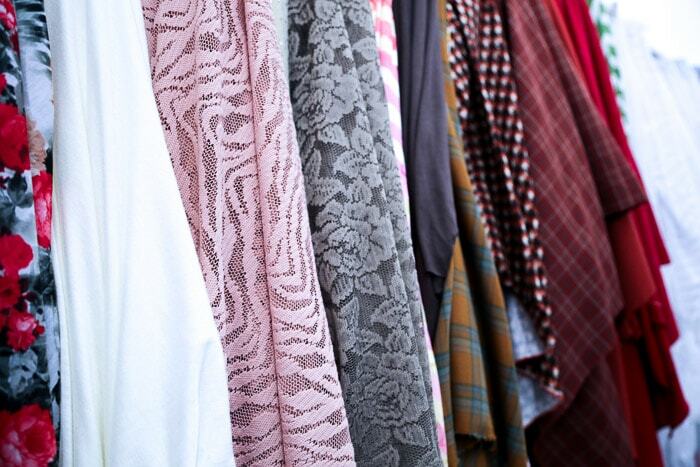 Yes, there is the stereotype of the grumpy older woman who works at a fabric store, but it’s just that – a stereotype. Keep in mind basic politeness and also that in very busy times employees may be pulled in several directions at once, but in all of my years buying fabric in all kinds of places, I think I’ve encountered and unfriendly/unhelpful employee less times than I could count on my fingers. That’s a great walk through JoAnn’s. I’ve been there so much over the years one gal remarked recently, “Oh, your kids are getting so big”. I had to laugh. This last trip I saw your patterns! So much fun!!! I would add to sign up for coupons and newsletters to know ahead of time about sales. I personally try my best to avoid my stores busiest times. I would also add that other shoppers can be a great resource too. People love to talk about what they’re making, ask about what you’re making, and are often willing to share their opinions or experiences with different materials. Any time I’m going to try something new, I like to ask someone to walk me through it. Experienced customers can be just as helpful (if not more) than store employees. How very nice (and thoughtful) of you to take the time to do this! Thank you Melly! I have been sewing a long time but am really enjoying your series. I sent the link from my fb to all my friends and family in case any wanted to join in on the fun. Thanks so much for taking the time. You are lucky to have a nice JoAnn’s in your area. In Santa Fe, NM, our JoAnn’s is staffed by a bunch of grumpy old women who will not help you if you break your leg in front of one or all of them. They argue with you about every coupon as if it is their own personal coupon and you are trying to take advantage of them personally by merely using one coupon for the notions and one for fabric as provided in the coupons, for example. I was trying to buy an ottlite that was 60% off and I had a senior coupon for an additional 20% and the cashier argued with me as if I were committing a crime. I politely asked her to run the coupon and viola, it worked. There was nothing that prohibited the coupon. I have complained to corporate but nothing has changed. The JoAnn’s in Albuquerque, NM, an hour away, is much more pleasant and they offer you the salvage end of the roll to you for a discount for example. In Santa Fe they would rather it go to waste. So I travel the hour or if I can find the item at Hobby Lobby or Michaels, that is where I will go.